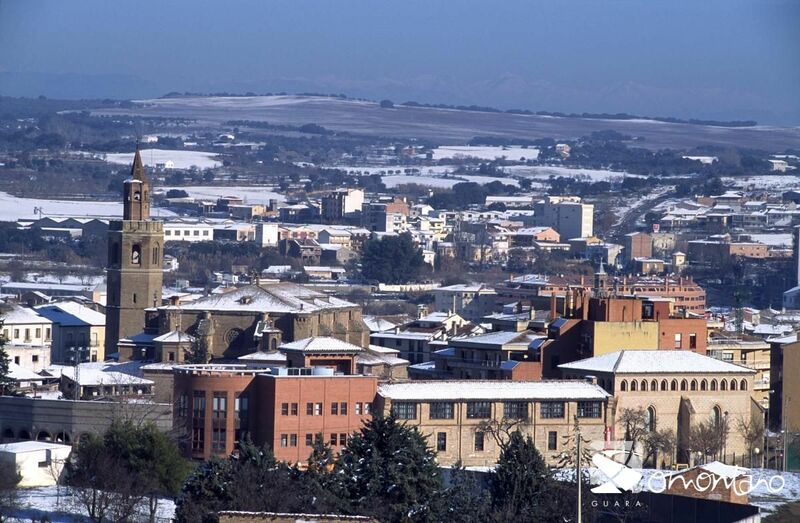 Since its foundation in the 10th century, Barbastro - or Barbatanya as it was known in Moorish times - has held the important role of capital of Somontano. Its geographical location resulted in it becoming the administrative capital of the area, with a great emphasis on commercial development. This important role has been maintained until the present day. This journey takes us back in time to uncover the secrets of the local history; to learn about the characters that helped shaped it and to discover the traces they left behind in the city. 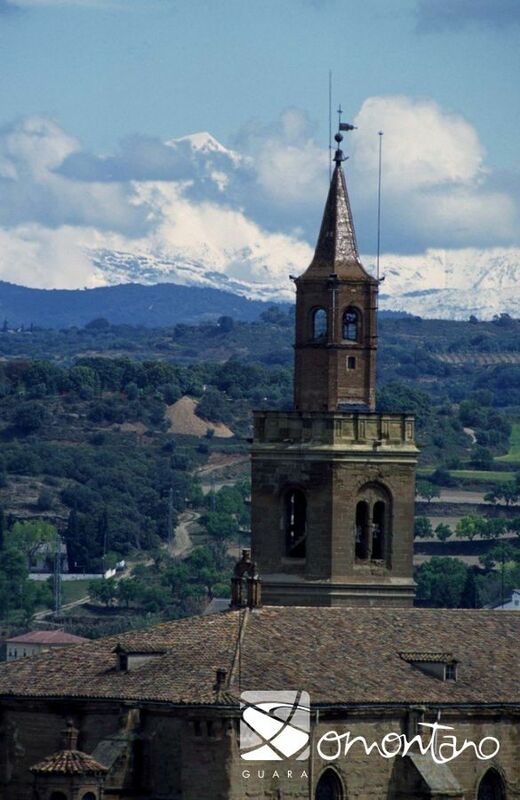 The climb to the impressive Monastery of El Pueyo should not be missed during a visit to Barbastro. The view from the hilltop location is unsurpassed across the whole of Somontano, . From the capital city, it is also possible to reach the towns of Burceat and Cregenzán, on foot or by bicycle, by following a path belonging to the GR45 network of paths. This historic collection of buildings can be described as the gateway to Somontano. Within the walls of the old city hospital, the Tourist Information Office provides visitors with details of the area. In the same building there is superb shop selling local wine and gourmet products, and the Wine Zone belonging to the Regulatory Board of the Somontano Denomination of Origin (known as the D.O.) The D.O. is the body that supports, promotes and controls the wine-producing activities within the Somontano boundaries. 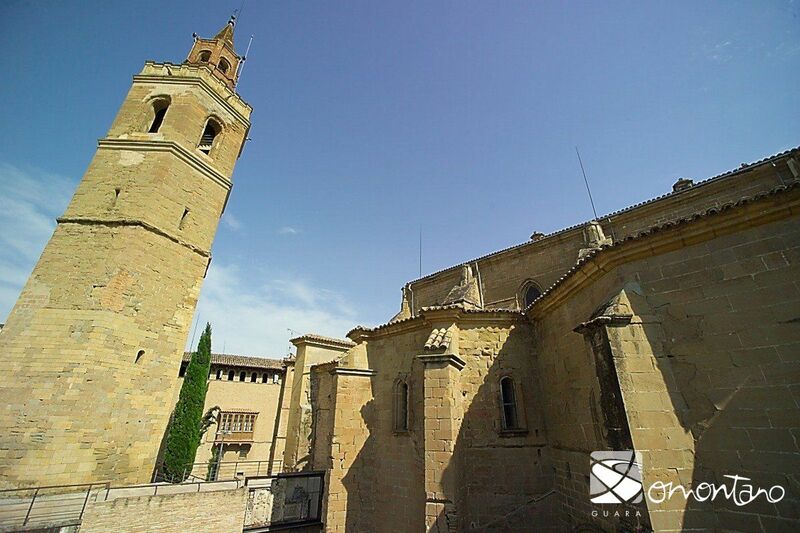 The gothic church of San Julián was built in the 16th century, and has recently been completely restored and refurbished as the Somontano Visitor Centre. The Catedral de la Asunción is the most emblematic monument of the city. The ambitious construction from the early 16th century, was a city project financed by the local council. The church was built in the style of a huge hall and has a total of three naves, which are all of the same height. This feature gives the open-plan interior a sense of space, balance and majesty. The remarkable altarpiece with its spectacular alabaster base is a work of Damián Forment, with help from his pupil Juan de Liceire, and is a particular highlight of the cathedral’s interior. In the late 17th century the cathedral was enriched with new chapels, two of which show clear 18th century Baroque elements. The bell tower stands apart from the main building, just to the north of the apse, and history provides an feasible explanation for this. The mosque that once stood on the same site was consecrated as a cathedral soon after the Christian conquest, and the minaret was converted into a belfry. Around the beginning of the 14th century, this minaret was knocked down and replaced by a medieval tower with thick walls, long before the current cathedral had been built. Early in the 17th century another section was added and the reconstruction of the spire took place in the 18th century. The final appearance and location of the tower are a result of all of these factors. The sound of its bells have always enriched city life, but in addition to civil and religious functions, the tower has also been used as a watchtower and as a refuge over the years. The Diocesan Museum is located within the Cathedral complex. In addition to displaying an interesting collection of gold and silver work and a variety of fabrics, it has brought together precious sculptures and medieval paintings. The excavations carried out in the grounds of the cathedral – known as the Archaeological Garden - have brought to light the remains of a 10th century mosque, a church, a Gothic cloister, an abbey and a late 18th century cemetery. The Episcopal Palace stands a few metres from the cathedral. In 1571, after many years of dispute, Barbastro recovered its position as the Episcopal Headquarters. The city promised to provide the bishops with a residence appropriate to their position, and so it bought a block of buildings to be adapted for this purpose. From the outside, the residence genuinely took on the appearance of an Aragonese palace. The tower to the side of the building is reminiscent of those found in fortified rural residences, and was a sign of power the occupants of this particular city dwelling could not do without. Alterations carried out in the 19th century have resulted in the current aspect of the palace. The Town Hall is located at the end of the square in the city centre. The original council building was built at the end of the 15th century under the direction of the Moor, Farag de Gali, who was the master builder to King Ferdinand The Catholic. The present building was drastically renovated in 1950, and features narrow eaves, large windows on the upper floor and a forged iron balcony. The meeting room still contains some of the original decoration. The place that is now occupied by the Hermanita’s Home for the Elderly in Need, was originally the site of the ancestral home of the Pueyo family. Later it became the headquarters of the "Casino of Friendship", one of the two in existence in Barbastro in the 19th century. The original building was demolished in order to make way for the first home of the “Hermanitas.” This order of nuns was founded in Barbastro in 1873 by Saint Teresa de Jornet and the canon and historian of the city, Saturnino López Novoa. The final building of the square is the College of the Escolapios. It was the first college to belong to the Escolapios Fathers of Spain (1677) and is still active to this day. The church, of Jesuit typology, has a Latin cross foundation with a cupola and a high longitudinal nave, which opens out to chapels where the galleries are located. Capitals, half-relief pilasters, mouldings and cornices; all speak volumes of a classic baroque decor. Inside the building important paintings by the Barbastro artist, Francisco Zueras, are on display. On the walls that face out onto Argensola Street it is possible to see a coarse coat of arms. 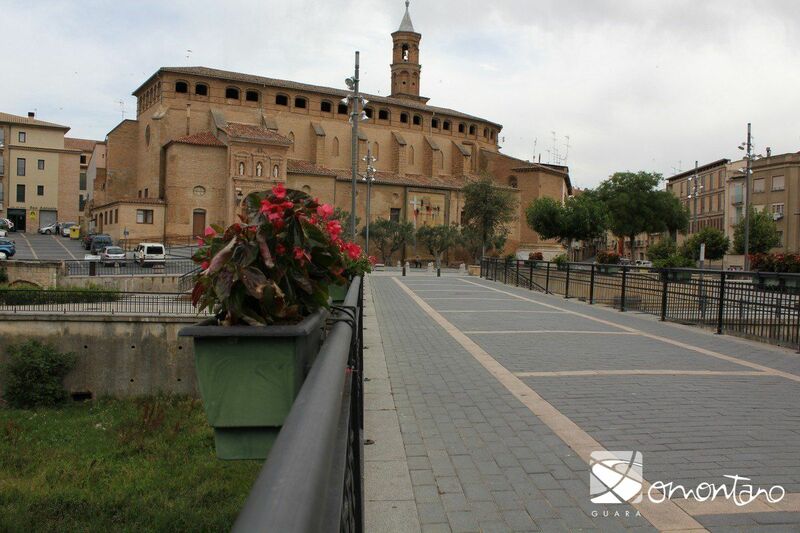 This is a reminder that the City of Barbastro originally donated this land - previously a street - for the building of a church. The Renaissance period is very much in evidence upon entering Main Street, which leads away from the church of the Escolapios. 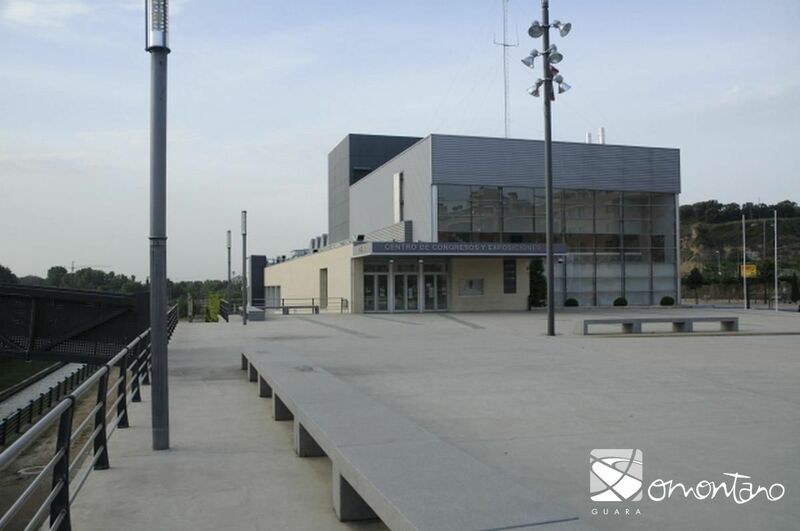 The building known as Latorre House or "Zapatillas House" is the location of the National University of Distance Learning (Open University) in Barbastro. Its brick facade, arched galleries and wooden eaves are typical of the buildings common amongst the middle class in 16th century Aragonese cities. The carved wooden eaves of the Argensola Palace are one of the finest examples of this kind of classic Renaissance decoration. The walls of the palace have witnessed the birth of famous Barbastrians such as General Ricardos, one of the great European military men of the 18th century, as well as the poets Lupercio and Bartolomé Leonardo de Argensola. They were considered to be the best writers of classical poetry of their era, which fell halfway between the 16th and 17th centuries. Barbastro’s market square is different to many other squares across Spain, in that it does not have any official buildings. The town hall and cathedral of the city both have their own specific squares, a sign of their respective civil and religious power. This particular square is a place for the region’s traders and market gardeners; a place to buy and sell, to trade and negotiate. At one end of the square is the Santa Ana Chapel (16th to 19th century). To the side of this stands the 'Almudi' which is a public warehouse or corn exchange, used for the buying and selling of wheat and other grains. The bustling activities in this building often caused the church, and those in it, to be covered in dust. The square’s oldest houses, of popular design with low porches, make up a compact, uniform front. The different styles and tastes that have appeared with the changing eras have provided a constantly changing scene, against which the Barbastro people continue to live out their daily lives. In 1926, the green light was given to a project to construct buildings of an historic nature, such as the San Pedro Warehouses and Calonge House (neo-mudejar). In 1975, the Entrearcos Cultural Centre was built on the land of the ancestral home of San José María Escribá de Balaguer. Inspired by the traditional Aragonese style, it was built using stone, open brick, reinforced concrete lintels and old Arabic tiles. Continuing along Argensola Street, the waters of the River Vero suddenly appear. Strong walls once protected the right-hand bank of the Vero, and these were later used as the base of several houses. These exceptionally high walls formed a compact, solid front, and meant that access to Barbastro from the left-hand bank was only possible via the bridges, which connected with the gateways to the city. Portillo Bridge was rebuilt in the 20th century along the same lines as the original. The first bridge, built around the year 1600, had three parts made of brick and was subject to heavy bombing during the Spanish Civil War. San Francisco Bridge, and the gateway that leads to it, both took their name from the Franciscan monastery, which had been established around the 13th century. On the left banks of the River Vero there were once three public fountains. These gave name to the area, Arrabal, which translates as ‘the poor area.’ The Azud and Vivero fountains disappeared with the canalisation of the river. However the San Francisco fountain, one of the finest in Aragon, still stands. Its construction was commissioned by the City Council in 1553, and it stands on the site of a previous spring known as the "Fuente de los Frayles”. The master sculptor Jaques de Guertch was responsible for the Renaissance layout, and the consummate stonemason Juan de Araçil, worked with him to create the final product. It was completed in only 5 months with clean white stone from the nearby Fonz quarries. El Arrabal, an area of the city that used to be outside the first walled enclosure of the medina, has its roots in the Islamic era of the 9th century. Just by the church of San Francisco, the San Antonio square holds the remains of public baths dating back to the 10th century, which had various vaulted rooms and lion-head fountains. The remains are not open for viewing at present. The San Francisco Monastery is in this same area of the city, and was founded between the 13th and 14th centuries. Its arrival coincided with a period of growth amongst the mendicant orders. In the San Antonio square it is still possible to see the foundations of the old cloister and the layout of its original walls featuring the small windows of the cells. These have since been transformed into private houses. Between the 16th and 17th centuries the medieval church was reformed and the large nave was covered with star-shaped ribbed vaults. During the 17th century new chapels were added, such as the Claramunt chapel with its mural paintings and a beautiful glazed tile plinth from Muel (Zaragoza). The church has a stairway that descends into an arched crypt, where a long bench crafted from stone is divided up into fifteen seats of honour. The bodies of the deceased were placed on these seats, and were supported by with the walls of the crypt. Some time after the construction of the crypt the merit of this system was questioned, which resulted in the lowering of some of the seat’s arms, to allow wooden coffins to be placed on the bench. There is also a small chapel covered with beautifully designed star-shaped vault, which is dedicated to Ceferino Giménez Malla, or"el Pelé" as he was also known. He was an honest gypsy mule trader, who was beatified in 1997 by Pope John Paul. From this part of the city it is easy to get to the San Juan neighbourhood where the La Barbacana Ice Well is located. 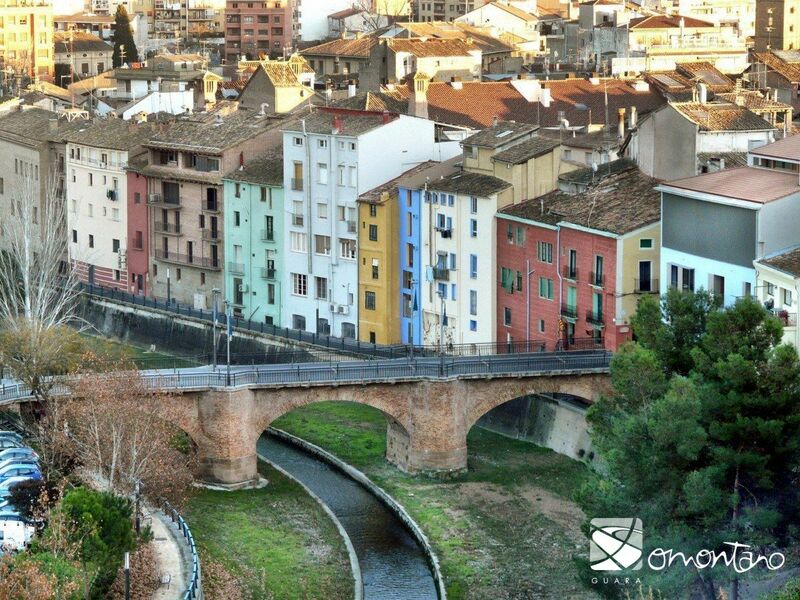 On the banks of the River Vero and nestling at the foot of an ancient city wall, this old construction has been carefully preserved because of its importance to the local history. It is one of the best examples of a unique industry that flourished in Somontano between the 16th and 19th centuries. The ice well has been tastefully converted into a small visitor centre, and inside its past is explained in detail through exhibits and audiovisual displays. Learn how the snow was collected and stored, how the ice was produced and distributed and the various uses it was put to.